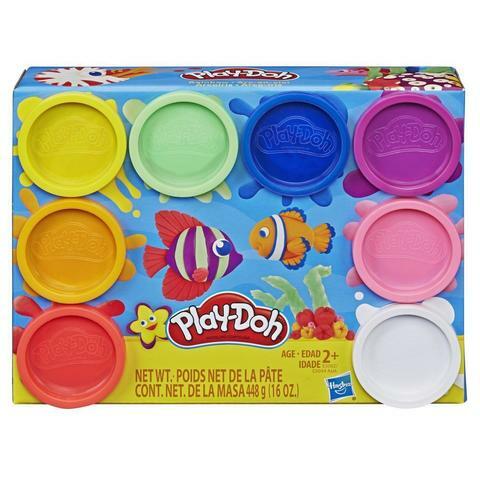 Start or stock up your Play-Doh stash with this 8-pack of non-toxic modeling compound in 8 cheerful Rainbow colors! This set comes with 8 2-ounce cans of compound in red, orange, yellow, green, pink, blue, purple and white. From building their own rainbow to mixing their own colors, kids ages 2 and up can pop these Play-Doh cans open and make almost any creation they can imagine. It makes a great starter pack for Play-Doh playtime or to add some extra colors to your Play-Doh toys at home (sold separately). Teachers can also use these fun colors of the rainbow for classroom activities! 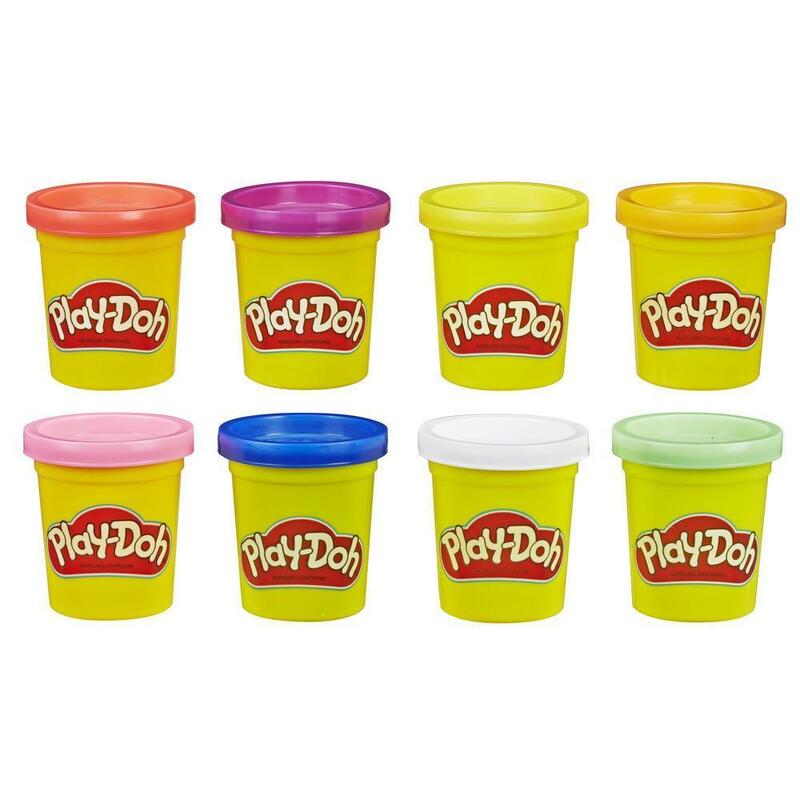 The airtight containers keep the Play-Doh compound nice and squishy to use again and again. Play-Doh 8-pack Rainbow modeling compound will brighten up playtime for kids ages 2 and up who love to craft and create with arts and crafts toys like modeling clay! • Includes 8 cans of Play-Doh Brand Modeling Compound (total net weight 16 ounces). • A RAINBOW OF 8 COLORS – Great for starting or restocking your Play-Doh collection, this pack of non-toxic Play-Doh compound has 8 cheerful rainbow colors: red, orange, yellow, green, pink, blue, purple and white! 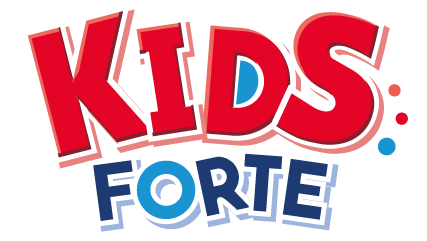 • SHAPE YOUR IMAGINATION – From building their own rainbow to mixing their own colors, kids ages 2 and up can pop open these 2-ounce Play-Doh cans and make almost any creation they can imagine! • KEEP IT FRESH TO REUSE AGAIN AND AGAIN – There are few things more satisfying than opening up a fresh can of Play-Doh compound. The airtight containers keep it fresh to play with again and again! 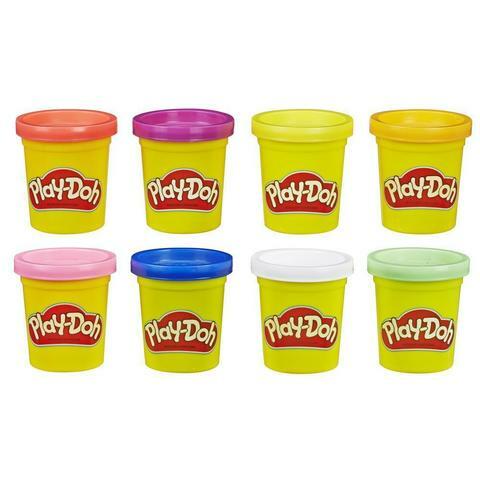 • THE QUALITY YOU KNOW AND LOVE – Play-Doh modeling compound has been a favorite since 1956! It’s made primarily with water, salt, and flour, and goes through vigorous testing so it’s always high quality and super fun! • KEEP THE WORLD BRIGHT - Our consumers tell us they believe it helps develop fine motor skills and hand-eye coordination, and all Play-Doh cans, lids, and packaging are recyclable to help build a more sustainable world!